This is a massive wine with great credentials. Almost black in the glass I knew I was in for a treat. Hoping for complexity, finesse and not the usual Aussie fruit bomb, I was not disappointed. This wine offered layers of blackberry, blueberry and chocolate with ripe plums interlaced . The tannins are fully integrated now and there is a gentle acidity to balance the package up. 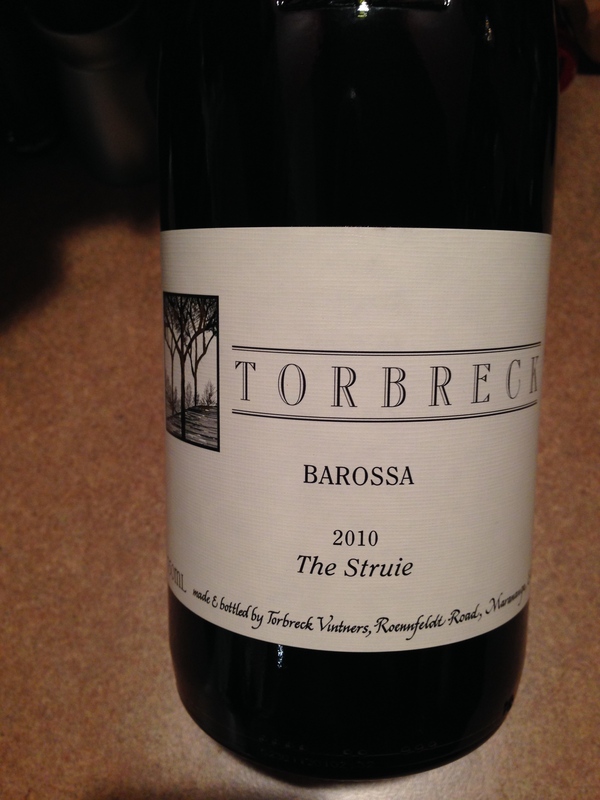 2010 was a great year for Barossa and it shows in this gem. Moxie and I paired this up with some massive Ribeyes, Spaghetti Squash, roasted Rutabaga and sautéed greens. The combination worked and allowed the wine to shine against the relatively basic flavors. This wine got large points (93 WA, 91 WS) for a good reason. It is well made and will provide lots of enjoyment for the $42 price, I agree with 91 and give it 4 stars. Salut….